Published on February 19, 2010 by Wade Shepard Follow me on Twitter here. SOSUA, Dominican Republic- This is the future of milk: it is called UHT milk or long life milk. It comes in a box, it can live without refrigeration for 6 months until opened. It can be shipped far from its source of production, it can be traded internationally, it saves money that would otherwise go towards preservation, and reduces loss through spoilage. 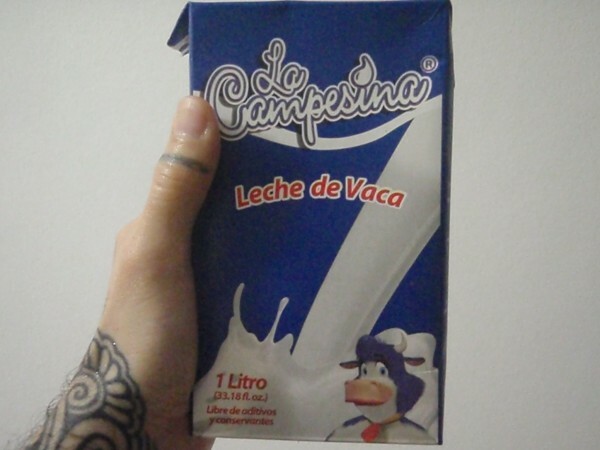 This kind of milk has quickly become the standard in many Latin American, European, and Asian countries. Any traveler who consumes milk will drink UHT milk when traveling, it is the standard. UHT milk is vastly cheaper to purchase than fresh milk, and it is cheaper to ship and store due to its lack of refrigeration needs. It is also said to be better for the environment because it does not necessitate the mass use of refrigeration prior to sale and, apparently, reduces the amount of greenhouse gases emitted from milk production. In Belgium, France, Portugal, and Spain UHT milk consists of over 90% of the total milk consumed. I project that these numbers are similar for many Latin American and Asian countries as well. I once tried to avoid this milk, it came in a box and I thought it was full of chemicals and preservatives. I thought wrong. I brought home a liter box of long life milk yesterday from a corner store in the Dominican Republic, and my wife shot it a rather hairy sort of eyeball. “It was the cheapest they had and it says that it doesn’t have any chemicals or preservatives on the box,” I explained my purchase. “Then how do they keep it from spoiling if it doesn’t have any preservatives?” Chaya asked skeptically, knowing well that this long life milk sits on grocery store shelves for a very long time. I could not answer Chaya’s question. If the milk did not need to be refridgerated, then it must have chemical preservatives in it, right? Milk is still perishable, right? UHT stands for “Ultra High Temprature processing,” which is just another way of heating milk to kill bacterial spores. In the pasteurization process, the milk is heated to 72°C (161.6°F) for at least 15 minutes, whereas the UHT process heats the milk at 135°C (275°F) for one to two seconds. This flash of extreme heat is said to kill off any spores in the milk, and is currently a process that is being used for other products such as fruit juices, cream, yogurt, wine, and soups. UHT is the name of milk on planet earth, and I predict that it will soon constitute 90% of all milk sales in virtually every country on the planet where commercial dairy products are bought and sold. Like most else that is fresh, wholesome, and good tasting, pasteurized milk is meeting its extinction to give life to its more economical, longer lasting, boxed doppelganger. Just as pasturized milk sent truly fresh milk to the golden aisles of the health food store and back corner of the farmer’s market, UHT milk is making pasturization a practice of the past. There is information to the contrary, but it is my impression that UHT milk is virtually the same as pasteurized milk nutritionally. The same voices who say that the pasteurization process rearranges the protein structures of milk say that the UHT process does this even more. They may be right. But what I do know is that under the banner of saving money and convenience, taste, as well as nutrition, will always be sacrificed. “Price is right” is the true inter-cultural mantra of planet earth. I am a traveler, I drink the same things as the people in the country I am traveling in. I want to save as much money as I can today so that I can travel another day. I too, drink boxed milk. Hi Wade: I first heard about this milk-in-a-TetraPak about 5 years ago – some German roommates told me that it was common back home, and how it lasts on a shelf in the cupboard, unopened, for months. I, like you and your wife, was totally creeped out. But now I live in Morocco, and have started drinking it myself – it is also more commonly bought here than fresh milk, though people tend to buy the fresh milk for special occasions/meals. I was glad to learn from your article just what the “UHT” stands for, and that it really represents a process, rather than some yucky chemicals. My tip to improve the taste? Drink it heated, rather than cold – I like to mix in a pinch each of cinnamon, cumin, cardamom, cloves, and sugar, or some combo thereof, and heat it to almost boiling. Delicious! This was exactly why I published this entry: I had no idea what this stuff was and it is becoming the standard for milk all over the world. I thought that other travelers may be interested in knowing that this milk is just treated differently rather than being pumped full of chemicals, and you proved me correct. Thanks! That is also a good tip for improving the taste. This UHT milk does taste good when drank warm. UHT milk is sold in almost every Starbucks in the USA. The milk is sold cold and favored chocolate or vanilla and therefore is not as noticeable for the taste change. It is also sold in big box stores like Costco as “school sized milk portions” for children to take to school for lunch. I read about UHT milk, my quastation is what UHT ? what is the fullname of UHT ? what is the process diagram of UHT milk. UHT stands for “Ultra High Temperature.” I explained the entire process in this article. I want to go ın to the ımportatıon and of UHT MILK.BUT some one told me that ıt ıs HARMFUL/POISONOUS to drınk UHT MILK WITHOUT BOILING IT..
and also would lıke to know whıch ıs Rıcher..UHT MILK OR THE PASTURISED? No, UHT milk is not dangerous to drink, it is virtually the same as “regular” milk. It has just been pasteurized differently. Wade, we returned to the US a few months ago after having lived overseas for several years. (In Australia and even Hong Kong, the places where we were based, UHT milk is not very widely consumed.) Landing in New York after such a long absence we were confronted by making new brand choices in many supermarket categories. Two things that struck me in the grocery store were (a) the proliferation of milk labeled as organic and (b) a tremendous discrepancy between expiration dates — some within a week, others two months away. Looking closer one sees that some of the milks (all refrigerated and in traditionally-shaped milk cartons) indicate they pasteurized while some are called “ultra-pasteurized”. Wow. In other words, these products are UHT milk without the UHT name and packaging, sold alongside the other refrigerated dairy products so we consumers will not think they are any different. Kudos to the dairy farms here in the northeast that rose to the challenge of marketing UHT milk to resistant American consumers. No one in our house drinks milk straight; we mostly use it in coffee — so we haven’t had the opportunity to notice the difference in taste. However, after reading your well-reasoned blog along with Wikipedia and a couple of ranters against UHT, I think a side-by-side taste test is in order. For those of us who are in places where refrigeration is not an issue and who have easy access to locally-produced (low carbon footprint) dairy products, the advantages to UHT appear to be minimal and may indeed take a back seat to the subjective question of flavor. Thanks for organizing this discussion. Thanks for this information on how UHT milk is being introduced in the USA. I think one of the major advantages of it is that it does not need to be refrigerated during storage and shipping and that it does not need to be rushed to retail, so it is probably saving the milk companies tons of money. It is interesting that they are putting it in standard milk cartons and refrigerating it in stores so the American public does not know the difference haha. It is my impression that UHT milk does not necessarily taste bad, it just tastes a little different. I think I have become use to it by now — like I was to eating canned green beans as a kid — and just take its taste as being that of “milk.” But I would imagine that if the milk companies are attempting to trick the American public into drinking UHT milk that they probably do something to try to make the taste match what the population expects from milk. Good observations, this is really interesting. From the standpoint of where we stand in the USA today — a big country, but one that is still possible to get across relatively quickly — I suppose UHT milk is the way of the future. There is going to be an interesting reaction when the American public realizes that they don’t need to refrigerate the stuff before it is opened. I am an American born and raised in West Virginia. For the last seven years I have been living and working near Vigo, Spain. Since coming here I have only consumed UHT milk from various brands. Coincidentally I work in a food/beverage distribution business that just recently began distributing UHT milk. I can say unequivocally that after seven years I now prefer UHT milk to the milk in the US. I go home to visit several times a year and truly find the fresh milk to be less milk-like than the UHT milk. The milk I drink is typically low fat or whole and it is very thick and tasty. Have my tastes changed? I am certain they have but the comments I have seen about a burned taste do not coincide with the milk I am drinking here. Also after 7 years I hope I can call myself an expert on the subject of the taste of UHT when compared to the main Giant, Safeway, Kroger’s and so on brands. It is also important to point out that there will certainly be different qualities at different price levels. Right now my price to the consumer here is 0,70euros per liter. That is about 0,97 cents in $ at the current euro to dollar exchange rate of 1.388. One gallon is 3.785 liters so a gallon of my UHT would cost about 3,68$. I have no idea how that compares to the cost in the US right now. Anyone care to give a few prices of milk in the US??? If you add in the savings associated with the lack of refrigeration throughout the transit from dairy to store you are talking about a lot of saved money and a healthier environment. I would be willing to bet that changing the US over to UHT milk would be worth more than all the oil savings from all the Toyota Prius you might sell in the next ten years. P.S. don’t get me started on my diesel engine 7 seater Pathfinder that gets 30-33 miles to the gallon nor my toyota station wagon that get about 50-52 miles to the gallon. One thing I would like to add. There are UHT milks that do taste like crap. They are VERY, VERY cheap (well some aren’t so cheap either) and are very watery. You do get what you pay for. Still I don’t think I can remember a burnt taste EVER. I am a habitual comsumer of Asturiana, Leche Pascual, Larsa, Bomilk, and now DeLeite – my milk. Anyone interested in importing??? I live in the Philippines and over here, you will only find UHT milk in the groceries. If you want real “fresh” milk, you will have to visit dairy farms. I dislike how UHT milk tastes and I still prefer fresh milk. Yeah, UHT milk is definitely something that you have to get use to — like canned vegetables — but once you do it just becomes the taste of “milk.” As I travel, I find that UHT milk is quickly becoming the global standard, and I now know its taste as being the one that I attribute to milk. I am sure people made the same adjustment when dairy farmers began pasteurizing their milk, or skimming the fat from it. Though I do think that I miss a good glass of old fashion milk like I grew up drinking. The U.S. Military has had the UHT milk for quite awhile. I drank it when I was in back in the ninties, and I know they have had it for awhile. It is better warm or with flavoring. I love this stuff. This is a very commendable information about UHT milk. My wife is always using this kind of milk and she is stocking one dozen every time the product is on sale and she told me it is a long life milk and i don’t mind about it. I just use them without complaining. Now i know what is UHT Milk from your very good explanation. Thank you and for sure i’ll be recommending usage of UHT Milk to my friends and associates and to open your website. nb. :I applied as UHT Operator and hope to start soon. Just read this article as I tentatively tried my first sip. In Barcelona and its just impossible to find the fresh kind. Doesn’t taste half bad and yes so cheap. 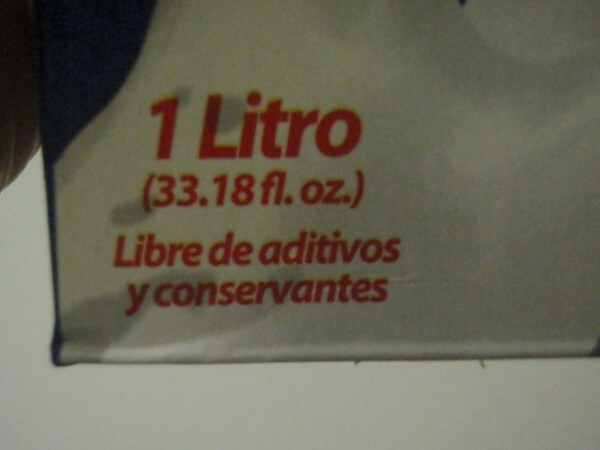 Now just need a bit more research on what all these spanish labels are, I think that was skim. Actually 2% is semi-desnatada and skim is desnatada. The nata part of the word means cream so skimming the cream off of the whole milk takes out the fat basically. I have lived in Galicia almost 8 years and see fresh milk pretty much in most large chains. It is just not consumed so much and therefore they have small stocks and you don’t find it in many of the smaller chains. I sell about 20,000-25,000 liters a month of the UHT stuff and as I have said before it is very good. It would probably cost me anywhere from 2,000 to 5,000 dollars a month just to be able to carry fresh milk. Not to mention the additional carbon added to the environment. It is truly is a crime that the United States does not obligate milk producers to go over to UHT. After the unpopular (and it surely would be with lobbyists doing their best to preserve the status quo – no matter the cost) change for producers in terms of cost, the country would see a real benefit from not having to refrigerate this stuff and have it delivered to stores in a matter of hours after it is pasteurized. Think of the savings in electricity and carbon usage. Here in Spain I get to store all of my pallets of milk at room temperature! I can wait weeks before I sell all of it! You have to work in this industry to understand what that means!!! Everyone should push hard for this kind of change. I matters more than selling a million Toyota Priuses. Very true. It often takes time for culture to catch up with technology, but within the next 10 years I predict that 80% of the milk bought in the USA will be UHT. The problem is that most people don’t really know what the stuff is. It is my impression that they think it is full of weird chemicals and preservatives — as I did before researching it. With a public education campaign I believe that the changeover will come. Interesting. In Australia, I recall when they introduced UHT milk, the marketing said it stood for ‘Ultra High Tension’, explaing that they had treated it in such as way that the molecules were re-arranged so the bonds between them were stronger and bacteria couldn’t break it down so easily – that’s why it lasted so long. That creeped people out and sales weren’t great. Then they re-badged UHT as ‘Ultra Heat Treated’, and sales went up cos heat ain’t so bad as rearranging molecules. Now every one thinks it is ultra heat treated – did they change the process or is this just a marketing con? To decide for yourself, I suggest you do this test: If you try and make yogurt (ie boil the milk for a bit, let it cool to around 50 degrees, add starter culture and keep it warm for 6 hours) out of normal milk, it works fine. If you try with UHT milk, it won’t work! The good bacteria just cannot get a hold on the UHT milk – this suggest to me that there is something else done to the milk – not just a simple heat treatment. Also, slowly boil some fresh milk and some UHT (simmer for 15minutes), then put them side by side and leave – see which goes off first – the UHT still lasts days longer before it slowly goes off (unlike the fresh which may be off in a day or so, depending on conditions). To me common sense says there is more to the story than just heat treatment! I just read some scientific papers from a conference and it seems that neither pasteurisation nor UHT kills all the bugs in fresh milk – especially bacillus spores. that might explain the difference you will get in the tests I mentioned above. Perhaps also, UHT is ultra high temperature processing AND this process happens to increase the molecular tension – so a marketing dept may have chosen the wrong characteristic to start marketing this stuff in Australia (without actually lying about anything – just being selective, but getting it wrong in thinking people would prefer ‘high tension’, to ‘heat treated’?). I am not a scientist here, but I do know that when high temperature/ quick exposure cooking methods are applied to other foods — such as in a lot of Chinese cooking — the structure of the food itself is different than longer duration, lower heat cooking methods. Perhaps this is a similar case with UHT milk. Actually – that might explain why UHT lasts longer even after boiling, but it still doesn’t explain why you can’t make yogurt out of it. Hmmmm……..
you can’t make yogurt because when they use “ultra high temperatue” to heat the milk they kill all the bacteria which is necessary to make yogurt. Regular milk is not heated to such a high degree temperature which still has bacteria in it to make cheese and yogurt. 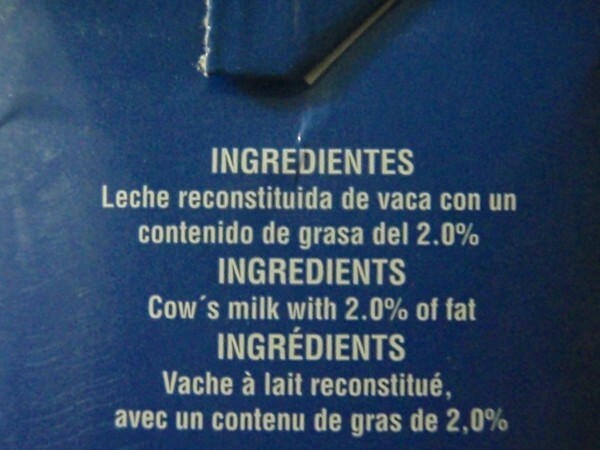 Hum… There are many lactose intolerant people in Spain, and they cannot drink UHT milk. It does have lactose then, right? Can we produce UHT from milk powder ???? No, the UHT process happens at the beginning of milk production. If milk is already in powder form it has already gone through processing. Anyway, powder milk already has an almost indefinitely shelf life. Hello! Almost no one drinks fresh milk in Spain either. 90% of Spaniards drink UHT milk. You go to the big supermarket once a month to do the “big monthly shopping” then you buy 12 bricks of milk, or 24 -depending on the family. Almost nobody drinks the milk directly from the tetra-brick. You heat it, then you add sugar, coffee, cola-cao (http://saborear.co.uk/catalog/images/Cola%20Cao%20tub.jpg) or cereals. The fact is, the taste of Spanish UHT milk is not good. Hi! I came accross this article as I’ve been googling “Why does long life milk taste better in Australia?” My family immigrated to AU early last year from the USA and I NEVER would drink shelf milk in the US. Yet when I worked at a grocery store here in AU, many many people would buy long life (boxed) milk so I thought I’d try it. It tastes great! My friend from South Africa had the same experience which long life milk in Africa and said that she, too, uses long life milk here in AU and is in complete agreement that it tastes the same as pasteurized milk. I’m going to continue my search to see if I can get an answer to this question but evidently, the Aussies have something other parts of the world do not. With all the heat here-its just not economical to buy refrigerated milk and keeping long life milk that I can pop in the fridge whenever the kids need milk for their cereal is so much better than running into town the night before! I feel better knowing that the milk doesn’t have BGH (bovine growth hormone) in it here too. In Canada UHT Milk in now being pushed by a couple of main suppliers. They are going to have a tough time. Way too expensive (sometime double fresh milk), and less desirable taste. Sitting on the shelf for 9 months, although very convenient, turns them off completely. I have noticed to overcome this they are now putting some varieties in a refrigerated section when on sale to help with their marketing… Sneaky.. This is what is needed to sell UHT Milk in Canada! If you informed each bargain shopper that the expiry date is 8 months, I am sure that they would think twice about the purchase. Another issue is the potential health concerns. all i can say if they replace fresh milk in the USA this crap. I glad that I live in Iowa cause i will just go out to the country and buy unpasteurized milk straight from the farmer , or milk his cows myself. I came across this article while looking other information up. I am here in the U.S. and have tried Hershey’s UHT milk and enjoyed it. My mom brought it home because someone had given it to her. Thanks for explaining how it has such a long shelf life. I was curious to know how that was possible. Thanks for this well written explanation of UHT milk. I just got back from Peru and was explaining to my wife the milk there and decided to google it and found your article and read it out loud to her. Firstly, if standard and UHT Pasteurization of milk altered proteins in the milk it would denature them making cottage cheese. And secondly, it does not matter how denatured the proteins of milk are our stomachs are filled with warm dilute hydrochloric acid which would certainly do this anyway. So any concern over the “altering of proteins in milk” is baseless and furthermore irrelevant. UHT milk does not only taste disgusting, it is also very bad for you health, as it contains none of the beneficial protein structures that raw milk does. (the proteins are destroyed in the heat treatment much like an egg is fundamentally transformed when cooked. I think most people would prefer milk that taste good, and is good for you, rather then milk that has a disgusting burned taste and can actually provoke your immune system to give you allergies. So to answer your question, no, UHT is not the future of milk, it is just a mistake like the 400 degree compass that will cease to be in thirty years or so. I doubt your “facts” here.